This is a fun project to use up pieces from old puzzles that may be missing pieces. Draw a circle on a piece of paper about the size of the wreath that you want to make. Mix different colors of green paint. Paint the puzzle pieces in different shades of green. You only need to paint one side. After the paint is dry. Begin gluing the puzzle pieces together following the circle on the paper. When the wreath is complete. 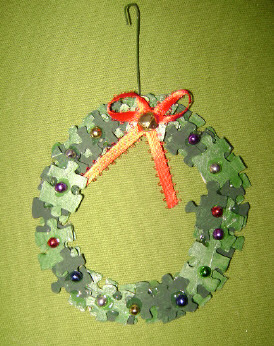 Glue on color beads and a ribbon with a bell in the middle and a hook on the back.